Synopsis: The true story of Captain Richard Phillips and the 2009 hijacking by Somali pirates of the US-flagged MV Maersk Alabama, the first American cargo ship to be hijacked in two hundred years. Love him or hate him, this is arguably Paul Greengrass’ best movie to date. As with all of his movies, you need to get ready to be up close and personal. Greengrass loves having the camera right up in people’s faces but it puts you right into the middle of the action and increases the intensity that this movie brings. And let me tell you, it is intense. It’s not long before the drama starts to unfold and you get the feeling of “uh oh”. How Greengrass gets amazing performances out of unknown actors, and even military personnel who didn’t know they were going to be in a movie, is beyond me. And it’s some of the little things that add up as well. For example, the gun marks left of Tom Hanks’ head after a gun was pressed up against it, just so you know the danger is real. The use of the military was amazing, and while it’s not too in-depth, it’s incredible what they had to do to execute this rescue. Greengrass perhaps took some liberties with some things, but the way he tells this story is incredible and extremely effective. The story here, like Gravity, is pretty simple on the surface. Four Somali pirates invade a cargo ship, kidnap it’s Captain and try to get back home to negotiate for a lot of money. However, this story is much more complex than that. Outside of the political game that was played off-screen, it’s the relationship dynamics between the pirates and Captain Phillips that bring depth to the story. We learn that these pirates are not working for themselves, but for a Somali gang Lord who is using them to get money and goods for the tribes. And it’s the pressure from these gang leaders that pushes these pirates to the brink which ended up being a huge disaster. The U.S. Navy gets involved and they begin a rescue operation, which ends up being one of the more incredible stories you’ll ever see. As for Captain Phillips, he’s calm at the beginning and is confident when the U.S. Navy shows up. He makes some questionable decisions that really puts his life in danger but at the same time you know he just really wants to get out of there. The dialogue for this script is awesome, believable and ironic at time. Everything flows together seamlessly and it gets intense. You may or may not end up caring for any of these pirates, but in the end it’s all about Captain Phillips and the amazing rescue that ensues. 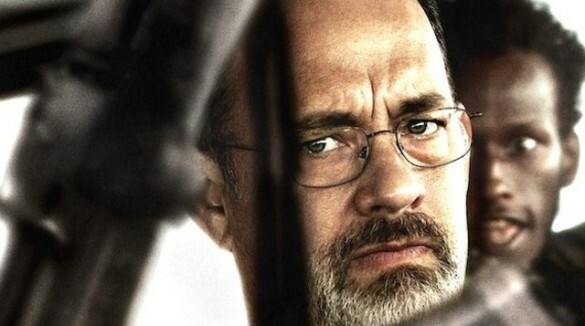 This is Tom Hanks best performance in a decade. He’s absolutely incredible as Captain Phillips. He has the accent down, all the mannerisms and brings an emotional depth I haven’t seen from him in awhile. The scene he has at the end is a reminder why he’s an Oscar winner and a beloved actor. While the story from the military side is incredible, this is the Tom Hanks show and he brings it on screen. As for Barkhad Abdi, a first-time actor, let’s just say if he is nominated for supporting roles, I won’t be surprised. For never acting before, him and his Somali friends are amazing and steal the show in their own right. They have a lot of screen time, some back story, and even put them in a light where you may like them on some level. And it’s not just the character writing. The performances make these characters a little likable, a little hatable and bring them to life. There is depth to these performances and for actors who’ve never done this before, they are almost flawless. When you combine that with Tom Hanks, get ready for an amazing boat ride thriller. Also just to note, Greengrass used real military personnel that didn’t know they were going to be in a movie, but you can hardly tell. Just wanted to throw that out there. The score here was done by Henry Jackman. Need I say more? Jackman is the Peyton Manning of movie composers. Or maybe that’s Hans Zimmer? If not Manning, he’s the Aaron Rogers of movie composers. He’s always reliable and is incredible with anything he puts his hands too and he doesn’t disappoint here. While not the most memorable of scores by Jackman, it brings an amazing intensity that the movie needed and has some great musical elements. I love Jackman’s use of drums in the action elements to really bring it when needed. There’s some African vibes to some tracks and it’s the type of score that is perfect for this movie. Captain Phillips is one of the most amazing films of the year so far and is driven by incredible performances from Tom Hanks and Barkhad Abdi. The story, while maybe not 100% accurate, is still amazing, intense and one that you’ll love to see. The military rescue is unbelievable and the execution is almost hard to believe. It’s like this story played out in a way that was meant to be a movie script. And the movie was very good.